My daughter has been away at school for two months, the longest stretch in her life that I've been away from her. I was excited to pick her up from UCSB for the Thanksgiving weekend after her last class on Wednesday around 3p. I was out hiking in other parts of the county for a few days beforehand and got a text from her that she was going to skip that last class. I asked her if she would like to go on a hike before we drove to Los Angeles. Her reply was "TAKE ME ON A HIKE FATHER". In bold caps, just like that. She really knows how to warm the old man's heart. Seems she hadn't been out hiking once since school started and was missing it. A heat wave was rolling through the Southland around the same time and it was forecast to be in the upper 80s in Santa Barbara. I had hoped to do some easy hikes along West Camino Cielo but that road is still closed from the Whittier Fire during the summer. We ended up doing a short but interesting hike off Gibralter Road, hiking to a trio of places noted on peakbagger.com. The most well-known of these is a local crag called Gibralter Rock, found just off the road about 5mi up on the west side. On the east side of the road, up through a few other rock features, winds a use trail that can be taken to Knob 2882 (another rock climbing objective), Flores Peak and possibly other places. There is a whole network of unofficial trails all through these hills that are groomed by local enthusiasts but not found on any maps that I can find. 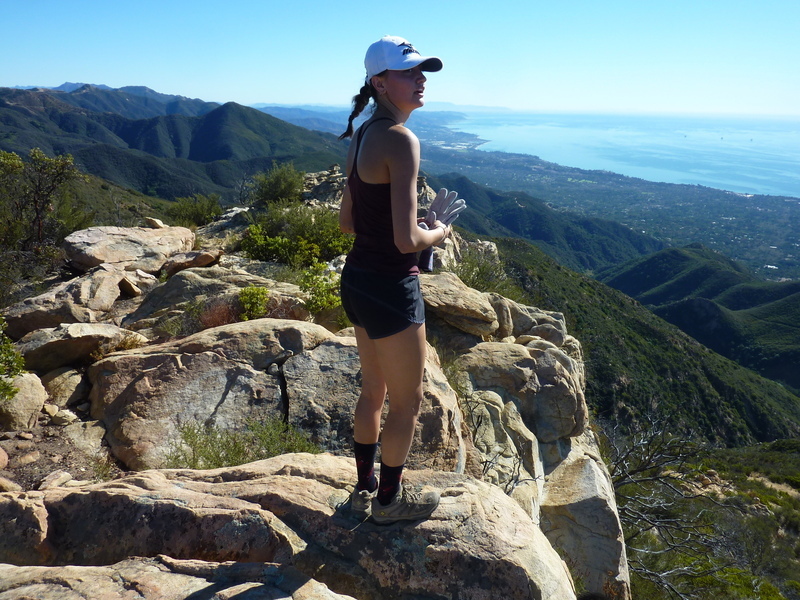 They can be found in online descriptions, satellite views and other places and make for a fun way to explore the mountains above Santa Barbara. Despite the heat (88F in late November at the coast seems obscene to me), the air quality was exceptional and we could see far out to the Channel Islands across a blue Pacific. One benefit of the heat was that we had the place to ourselves. The only other folks we saw were on Gibrlater Rd - the construction crews still trying to rebuild the road from the previous winter's damage, and the cyclists that ply the road in both directions.